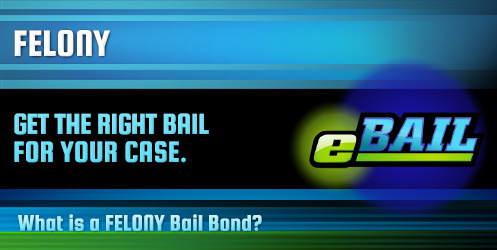 eBAIL provides Fast, Cheap, Online Felony Bail Bonds in Las Vegas, Nevada 24/7. Also serving Felony Bail Bonds in North Las Vegas, Henderson, Boulder City, and Nationwide. If you, a friend, or a loved one have been arrested on felony charges in Las Vegas, you will be taken to jail where you will be processed and booked to await a preliminary hearing. At this first hearing of charges, the judge will set a bail amount. This bail is the amount of money determined by the judge that must be paid to be released from jail before the trial. Because felony charges are more serious than misdemeanor charges and often result in jail or prison time, there is an increased risk that the accused may try to flee before the trial. Because of this, the judge will most likely set the bail at a high dollar amount to make it more difficult for the defendant to leave jail before the trial. When you don’t have enough money to pay the full amount of bail, you can pay a percentage to get a Felony Bail Bond. Like other types of bail bond, a Felony Bail Bond is used to help an accused individual to be released from jail to await trial without having to pay the full amount of the set bail. In Las Vegas, bail bonds can be purchased from a bondsman for 15% of the bail amount. It is important to remember that the defendant must attend the trial or the bondsman may use a variety of legally approved methods to obtain repayment of the full amount of bail as well as to secure the defendant to be returned to the custody of the law enforcement system. Which Jails Accept Felony Bail Bonds? Once arrested, a defendant cannot be released from jail until after a bail amount has been set by the judge at a preliminary hearing. There is nothing that can be done until that point. However, once the bail amount has been set, there are three ways to be released from jail. Pay the full amount. The whole amount of bail may be paid in order for the defendant to be released from jail. However, this amount can be extremely high in felony cases depending on the severity of the charges. Pay 15% of the bail amount. A bail bond may be purchased for 15% of the bail amount. This is often the chosen method, especially in felony cases. Hire a criminal defense attorney. An attorney can work with the judge in an attempt to reduce bail. However, this method may take days or weeks with no guarantee of reduced bail. Depending on the day of the week, if it is a holiday, and any difficulties occurring in the jail, the release process can take anywhere from 6 to 16 hours at a minimum. It is important to remember that this process only begins once bail or a bond is paid. eBAIL is highly experienced with Felony Bail Bonds and can work with you for release of your friend or loved one. The bondsman will find out in which jail your loved one is being held and the amount of the bail. eBAIL will work with you on payment arrangements for the 15% if you are unable to pay the full amount. Fully licensed, eBAIL makes the bail bond process as quick and easy as possible. Call us right now for help at 702-462-9200 – there is never an obligation, we just want to help you.